Bulava Test Postponed At Last Minute? According to Rossiyskaya gazeta’s sources, Bulava SLBM test platform Dmitriy Donskoy was on-station in the White Sea for a launch last week, and all test arrangements were laid on — command and control, international notifications, ground and space tracking, telemetry, support and rescue ships, but the launch was put off at the last minute. But, Rossiyskaya concludes, it turns out there was a reason serious enough to return the submarine to base. So it comes to nothing, and Defense Minister Serdyukov’s 8 September comments added no clarity to the situation, according to the paper’s account. So, we don’t know the reason why a launch was prepared, drew close, and didn’t happen. 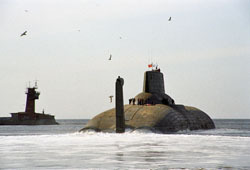 It suggests some continuing problem or doubt about Bulava’s performance, or continuing disagreement over the system’s readiness for its next test. This entry was posted in Defense Industry, Naval Modernization, Strategic Forces Modernization and tagged Bulava, Dmitry Donskoy, SLBM. Bookmark the permalink.